The Horowitz Center for Health Literacy, the Institute for Healthcare Advancement (IHA), and CommunicateHealth, with Consumer Health First sponsorships, hosted the inaugural Health Literacy in Action Conference October 25-26, 2018 at the University of Maryland, College Park. An introductory workshop opened the conference on the afternoon of the 25th, and the second day culminated in a full agenda of practical tips, tools, and strategies to address health literacy. The conference brought together around 100 attendees and speakers from different disciplines and areas of the country, all with a shared interest in health literacy. “We are here to level the playing field of health literacy,” said Michael Villaire, President of the Institute for Healthcare Advancement, at the conference’s opening plenary. He was followed by Monica Spann, a community health worker from Prince George’s County, Maryland. Spann shared anecdotes about the type of help community members need and detailed the value of personal connections with community members. Dr. Robert Gold, a professor at UMD’s School of Public Health, spoke on the needed relationship between health literacy and digital communication and information technologies. The rest of the day continued with four workshops on different aspects of health literacy. Janet Ohene-Frempong from IHA spoke on cross-cultural health communication. Her workshop answered a crucial question: How do we effectively meet the needs of diverse communities? Sandy Williams Hilfiker from CommunicateHealth held a workshop on the user experience. Hilfiker shared evidence-based tips on simplifying users’ experiences on health organizations’ websites -- especially clients with limited health literacy skills. CommunicateHealth’s Stacy Robison led an interactive workshop centered on lessons learned from practicing health literacy in the field. Robison had attendees break down confusing language and designs to better serve clients. 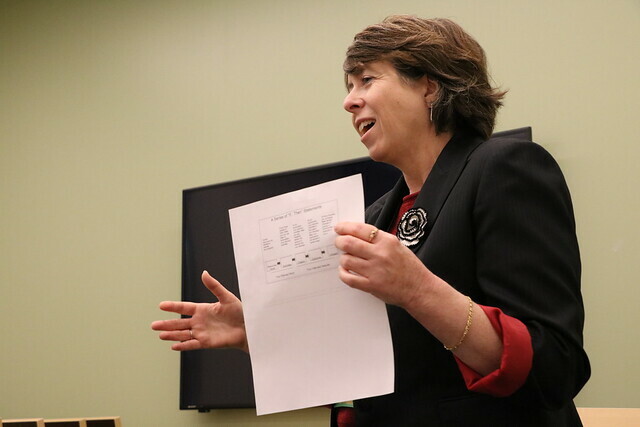 Dr. Cynthia Baur, from the Horowitz Center for Health Literacy, helped attendees determine the ideal health literacy activity for their organizations. By the end of the workshop, attendees had begun a draft activity plan to take back to their organizations. The conference concluded with a panel led by Consumer Health First’s Leni Preston, the Horowitz Center for Health Literacy’s Dr. Alice Horowitz, and the Health Care Improvement Foundation’s Susan Cosgrove and moderated by Villaire. The panelists inspired the audience, sharing concrete ways to advance health literacy. Preston talked about how consumers can become advocates in the policy domain to make sure their perspectives are considered in policymaking. Horowitz described what she and her team learned from an organizational assessment of Maryland’s public health dental clinics and encouraged others to conduct similar assessments. Cosgrove explained how southeastern Pennsylvania built a coalition that is providing necessary health literacy training and other services in the state. Baur, Robison, and Villaire shared closing remarks, reminding attendees to take what they learned and put into action in their organizations. Dr. Devlon Jackson presents on communication inequalities in communities of color experiencing psychological distress.